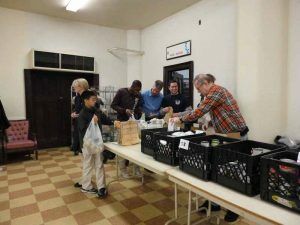 For over 25 years, Trinity Lutheran has been ministering to the hungry and needy. 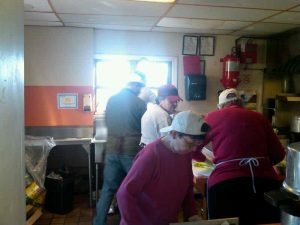 Every Saturday morning between 10:00 am and 1:00 pm you will find a hive of busy bees cooking, serving, and offering comfort to those less fortunate. It is hard work but exceptionally rewarding. Together with volunteers from local churches and schools, our Soup Kitchen serves homeless men and women as well as children and families. 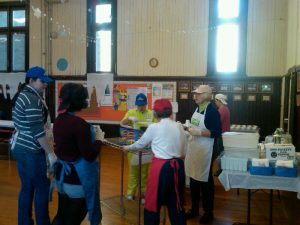 On average, our Saturday Soup Kitchen serves approximately 150 meals. With no eligibility restrictions, hot “sit-down” meals are offered to all without regard to age, gender, race, income, or denominational affiliation. Between 12:00 noon and 1:00 P.M. our Soup Kitchen meals consist of a healthy, diverse menu that includes fresh produce and meat/proteins. Guests dine in a clean, safe and supportive environment. Our weekly Food Pantry serves predominately senior citizens, children and families. Groceries are offered to all without regard to age, gender, race, income or denominational affiliation. Between the hours of 11:00 A.M. and 1:00 P.M., our Food Pantry distributes well balanced food stuffs that are designed to provide three meals per person in each household. 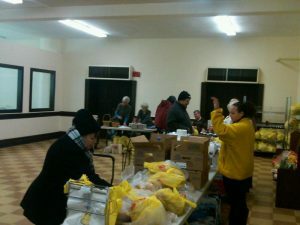 We also distribute fresh produce, bread and other supplies when available. Occasionally when available, we distribute dog and cat foods and try to be mindful that our furry friends need support also. Volunteers are always welcomed. Please contact the church office or visit us on any Saturday for more information!